Recently, the Illinois House of Representatives overrode Governor Bruce Rauner’s veto to enact a 32% state income tax increase. The individual rate went from 3.75% to 4.95% and the corporate rate went from 5.25% to 7%. The higher state income taxes could entice more people to leave a state that is already losing population.While taxes are not usually the main reason for moving, they can certainly play a role. Some states use their lower state income taxes to attract residents and economic activity. On the other hand, higher state income taxes can improve schools, roads, and other public services provided by a state. 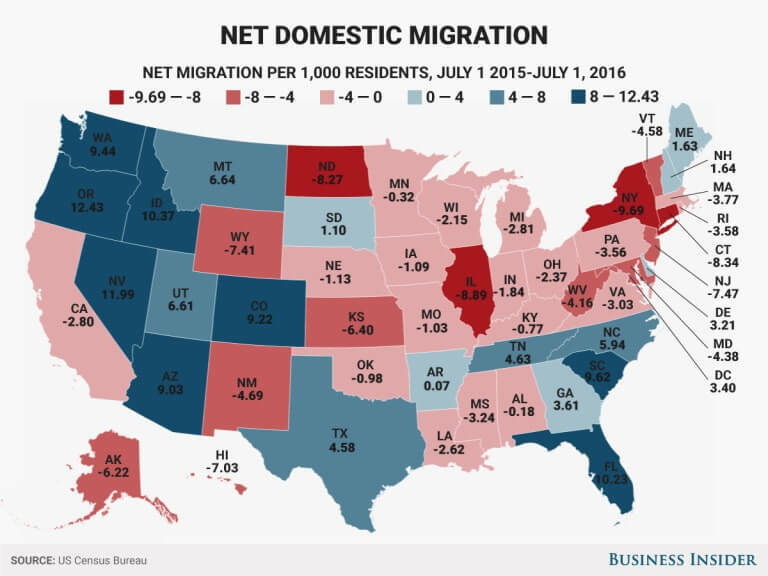 The top state in terms of net migration is Oregon. Increased migration to the Beaver State may debunk the theory that Americans are moving to states with lower income tax. Oregon has the third highest state income in the country at 9.90%. However, Oregonians do receive some tax relief, as the state has no sales tax on purchased goods. Three of the top ten states in positive net migration are states that have no income tax: Nevada, Florida, and Washington. Among states that had the ten lowest numbers in net migration, New Jersey and New York were also in the top ten in terms of highest taxes. So, do state income taxes have a major impact on which states people move to? It is difficult to give a definitive answer one way or another. However, it can certainly be said that Texas and Florida have become more attractive to domestic movers than California. Conversely, Oregon still manages to attract plenty of residents with its high tax rate. No matter what a state’s tax rates are the reality remains that people will choose to move for a variety of reasons. Still, the tax rate remains a major factor to some when choosing to move to another state.